You are here: Home / Great Deals / Kmart Has Online Layaway! 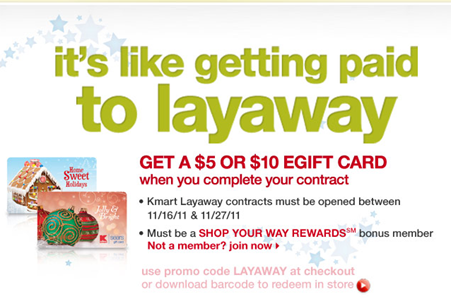 We do not have a Kmart around here anymore, but, Kmart has Online Layaway! They are also giving a $5 or $10 gift card once your layaway has been paid! NICE! You have to open your layaway no later than tomorrow, 11/27/11 – so, get shopping! of balance due are required after down payment for an 8-week layaway contract. jinna » Same here. It sounds like you use it just like online shopping, so they should ship it. I would call customer service though just to be sure. jinna » You’re very welcome!